The apartment was great, 2 little local pubs nearby (bricklayers arms and the welcome inn) with cheap drinks and very welcoming locals. The apartment is not far in car to all of the places we wanted to visit in manchester (canal street, the comedy store etc) , well worth the price we paid. Place was nice and clean with simple written instructions for heating etc. The property was fantastic amazing view and great location. All clean and ready for us. The beds are so comfortable and there was so much room for us all (5 people) The staff are so friendly and always kept us up to date via WhatsApp. If I ever go back would 100% stay again. Views are fabulous at night. Secure with parking & quiet. Will look to use properties again. Apartment was modern and very nice. Great location and amazing views from the balcony! Would definitely recommend and will be returning for my next time in Manchester. The keys are in somewhere else it takes time to go and grab the keys and this is inconvenient. Also, the codes to access the doors not always right only the main entrance not the parking. Also, NO free parking I paid to park my car and it had to get out from the building and inter from the main entrance because the pass code from the parking door is not correct. One of our bestsellers in Manchester! 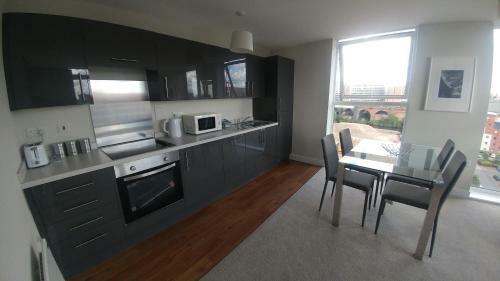 Featuring a garden and free WiFi, Clarus Living Manchester Gate Apartments provides accommodation in Manchester. Each accommodation unit includes a seating area with a flat-screen TV, a kitchen with a dining area, and a private bathroom. Some units have a terrace and/or balcony. The Opera House is 0.9 miles from the apartment. 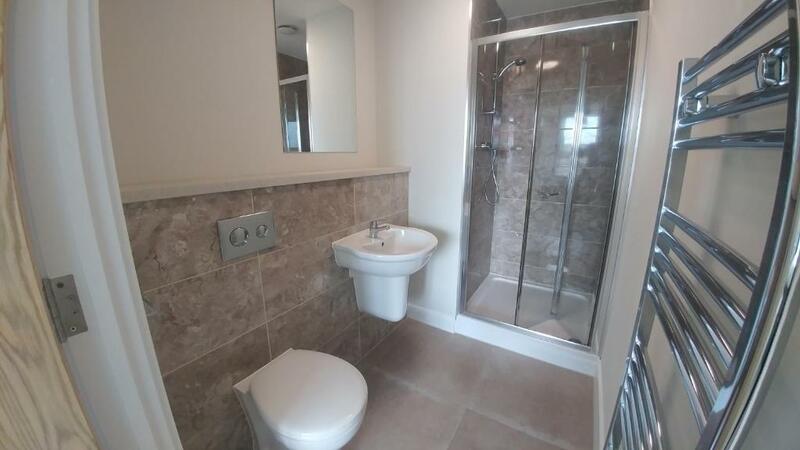 The nearest airport is Manchester Airport, 9.3 miles from the property. Clarus Living Manchester Gate Apartments has been welcoming Booking.com guests since 11 Aug 2017. 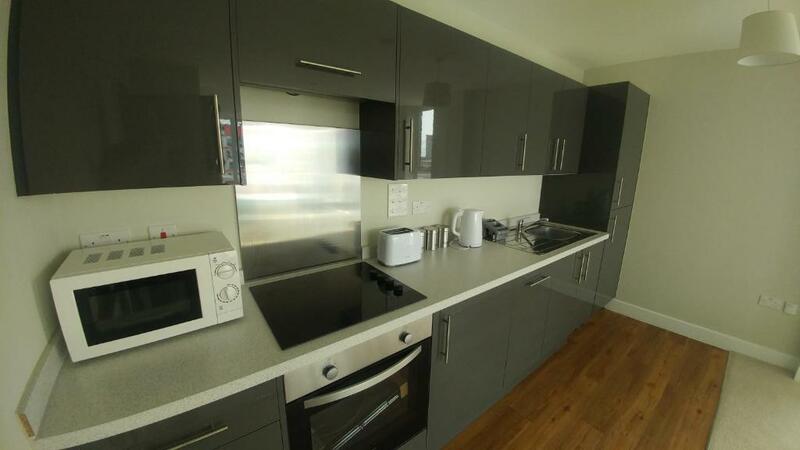 When would you like to stay at Clarus Living Manchester Gate Apartments? 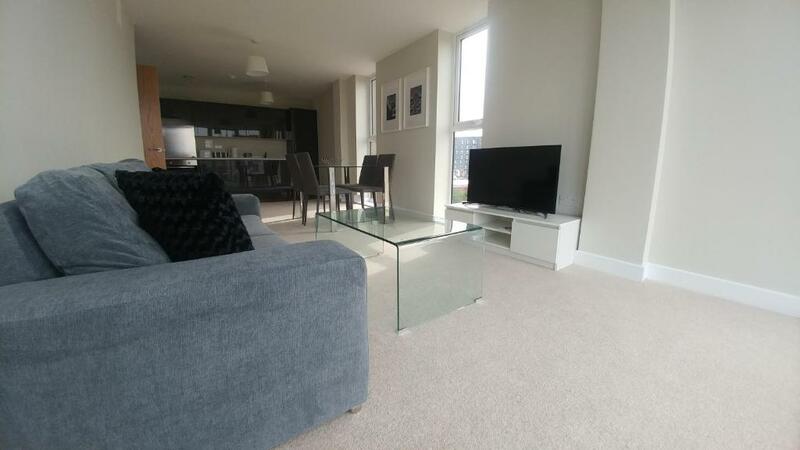 A recently built apartment building situated conveniently between Manchester City Centre and Salford Quays with easy access to Old Trafford, Trafford Park, and Old Trafford Cricket Ground. Spacious, beautifully decorated 1, 2, and 3 bed apartments suitable for business travellers, contractors, and especially for families who love lots of space and separate rooms (we have books and games for your little ones). Some parking is available, subject to availability, and must be booked prior to arrival. We have wi-fi throughout, fully equipped kitchens, and the convenience of dishwashers, and washer dryers, along with an iron and ironing board for those who need to look smart. Bridgewater Gate is one of a series of new developments along Ordsall Lane. Restaurants can be found nearby on Trafford Road, there is also a KFC and a Macdonalds towards Regents Road. Shopping can be found at Regents Retail Park. 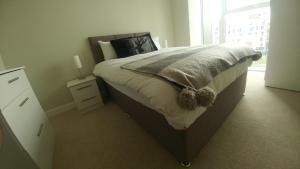 House rules Clarus Living Manchester Gate Apartments takes special requests - add in the next step! Bankcard Clarus Living Manchester Gate Apartments accepts these cards and reserves the right to temporarily hold an amount prior to arrival. Clarus Living Manchester Gate Apartments accepts these cards and reserves the right to temporarily hold an amount prior to arrival. Please note that the check-in and key-collection take place at: Londis - BP Salford Service Station, Trafford Road, M50 3XB Salford. Please inform Clarus Living Manchester Gate Apartments in advance of your expected arrival time. You can use the Special Requests box when booking, or contact the property directly with the contact details provided in your confirmation. Customer service was Awful Collecting the keys was a nightmare A lot of broken facilities in the apartment When booking the accommodation was advertised as a penthouse when we got there it was a tiny two bed flat. When ask to upgrade we got no response then hung up on. The initial booking was a nightmare. The hot water is only on for a certain amount of time. By time we had travelled around Manchester for an hour and a half and finally got the keys the hot water was switched off at the apartment. It goes off at 4 and doesn’t come back on until 7. I was going out at 7pm so I couldn’t get a shower after travelling all day. I was going to see Nicki minaj at the MEN without a shower!! Horrid. I felt minty and it ruined my night. The room was clean, tidy and comfortable. The bathroom light would turn itself off after seconds of being turned on and would not turn back on for several minutes. It continued to do this all weekend. Despite contacting the emergency contact number on arrival this was not rectified at all during our stay. We were unable to contact the hosts directly to sort the issue. The property was listed for 4 people, but there were only 3 bowls and 3 sets of cutlery. There was only a two seater sofa. Property was well presented, clean and easy to find. Pre-paid parking was secure and gated. Room was not clean from the night before and they would not refund the stay, beds had been slept in and mcdonalds rubbish on the table from previous guests. Arrived at apartment to find cocaine on kitchen table, cigarette ends all over apartment, used condoms on floor and vodka bottles in each room. Main bathroom light didnt work, shower tray in ensuite overflows due to blockage, The apartment whole smelt of cigarettes. Finally got into a clean apartment at 6pm. Check in was from 3pm. Clarus living offerd no refund shocking! Cleaner was very apologetic and worked hard. There is very little parking and was not aware i had to book at least 24 hours in advance until i called to ask where i could park, the construction workers around us starting work at 7/7.30am was annoying but i understand that has nothing to do with the apartment and is only temporary. Beware! The booking procedure is a complete nightmare. You are asked to send all your ID’s to some people sitting 1000’s of miles away in an accent which is hard to understand as if you’re purchasing the property rather that just spending a night. Then you’re asked to put down a security charge upfront. Then you’re asked to go to petrol station and give them a code to collect your key. The problem was that I had booked assuming all is going to be smooth like when you book any other hotel and I set off only to receive calls from some foreign country giving instructions which weren’t making sense. I got delayed and didn’t receive my code. By the time I got to the petrol station it was closed for refuelling. By the time I got to the accommodation it was late and I struggled to find the place and to get in. Total nightmare. How nice would it have been if all this was explained before booking! I wouldn’t have booked it all as a last min place assuming all will be smooth. Really spoilt our trip. Hosts details were on a folder once inside the place but what use was that when you couldn’t get in touch with them for the booking nightmare and just to get hold of the key to get inside. It’s not really didn’t like but more FYI there was only 4 of certain things like 4 cups 4 wine glasses and there was 5 of us so we made do and please don’t take this in a bad way. Even better if there was some basics to make a hot drink with on arrival...until you get your bearings. Some hooks to hang your coats up in the cupboards in hallway would be really useful. An acknowledgement that the keys were safely received (if posted in mailbox & holding some cash on reserve in case of loss/damages) would be much appreciated. Only problem was we were told to collect the keys from a garage about 15 mins walk away from the apartment, turns out the key wasn't dropped off so we could of just gone straight to the apartment from the train station - it wasn't a huge issue but could of been organised easier and saved us the taxi money from the train station.